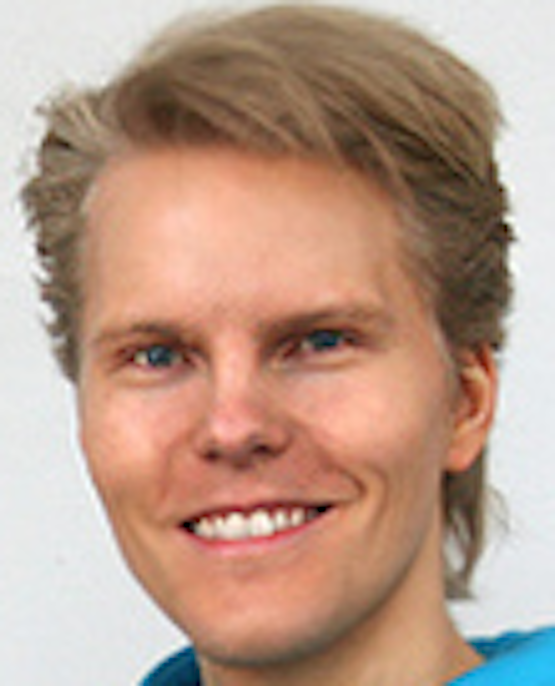 Björn Brändewall: "Based on a 1989 ruling of the Court of Justice of the European Union, and on article 19, the Charter of Fundamental Rights of the European Union, 'No one may be removed, expelled or extradited to a State where there is a serious risk that he or she would be subjected to the death penalty, torture or other inhuman or degrading treatment or punishment'"
Mr Björn Brändewall is a MP candidate of the Swedish Liberal Party (Folkpartiet), currently member of the leading board of the Liberal Party in the “Kalmar Län”, Sweden [Coat of arms of the Kalmar Län at left. 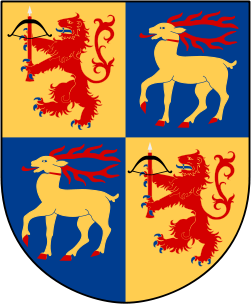 Län are the first level administrative and political subdivisions of Sweden, equivalent to “region” in Italy or the “state” in the U.S.]. The Swedish Liberal Party (Liberal People’s Party of Sweden, in Swedish Folkpartiet liberalerna, FP) forms part of the center-right coalition of the current government of Sweden. It is the second largest party in the government coalition. 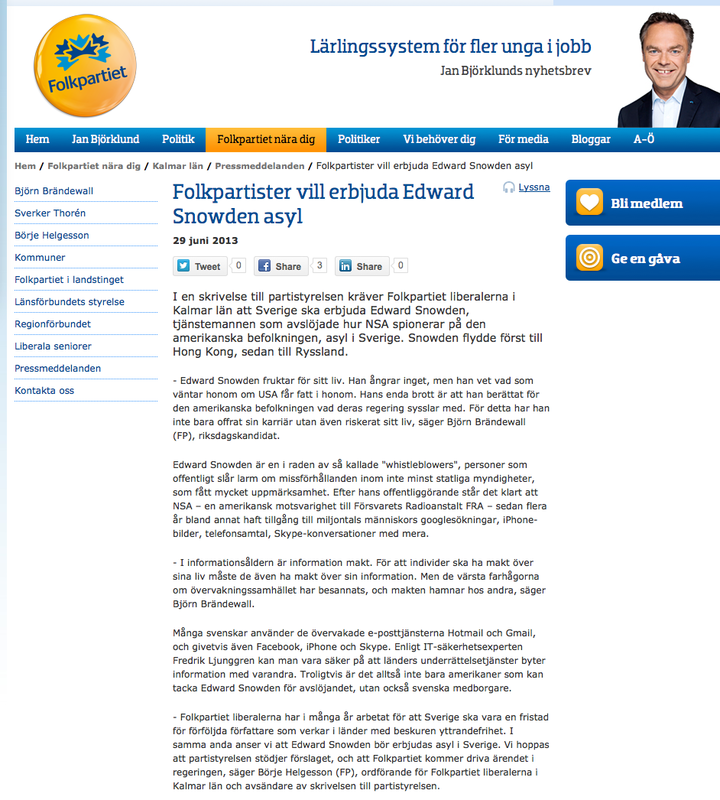 The Swedish Liberal Party at Kalmar sent recently a request to the national leadership of the said party, to consider the asylum for Mr Edward Snowden. The missive was signed by the Chairman of the Swedish Liberal Party in Kalmar, Mr Börje Helgesson [picture down at right]. Mr Helgesson, together with Mr Brändewall [picture down-left], also wrote an opinion article in Barometern headed “Liberal Party wants to give asylum to Snowden“. Declarations of the initiative’s authors have been published in the official site of the Liberal Party of Sweden; the text is visualized in the screenshot, down below this text. For instance, Mr Brändewall declares, “Edward Snowden fears for his life. He does not regret anything, but he he knows what he can expect if the U.S. [authorities] manage to get hold of him. His only crime was to tell the American people what their government is up to. For that he has not only given up his career, but he is also risking his life”. Brändewall continues, “In the information age, information is power. For individuals to have power over their lives, they must also have power over their information. However, our worst fears of a surveillance society have become true, and others end up with that power”, says Björn Brändewall. For his part, the Chairrman of the Kalmar Liberals Börje Helgesson states that “the Swedish Liberal Party has been engaged during many years to make Sweden a refuge for persecuted authors working in countries with restricted freedom of expression”. He also hopes that their proposal of asylum for Mr Snowden will be treated at government level. I asked Mr Brändewall for an interview in Professors blogg, which he kindly accepted. Here below his answers. Professors blogg: Thinking that an indictment against Mr Snowden might comprise the possibility of death penalty, what kind of reassurances do you think it could be obtained from the authorities (Government or Immigration authorities) on that Snowden will not be send to the US in case his extradition is requested? 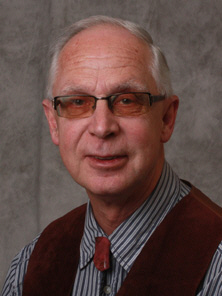 Professors blogg: What level of response (mainly positive or mainly negative? ), has your proposal have got among your peers in the Liberal Party or among the young liberals? Professors blogg: Has the Liberal Party’s national leadership already scheduled the discussion of the proposal done by the Liberals at Kalmar Region? Advocating in benefit of a Swedish asylum for whistleblower Edward Snowden, it is a human-rights goal that Mr Björn Brändewall, Mr Börje Helgesson and Professors blogg share sincerely. I.e., Why Sweden should consider asylum to Edward Snowden, by Marcello Ferrada-Noli.